On December 28, 2004, five Washington Court House Research History students, seniors Chris Burgess, Megan Dwyer, and Sara Randolph and juniors Andy Sheridan and Derek Stockwell, together with Creg Stockwell and Research History teacher Paul LaRue, traveled to Yellow Springs, Ohio to conduct interviews of World War II and Korean War Veterans. 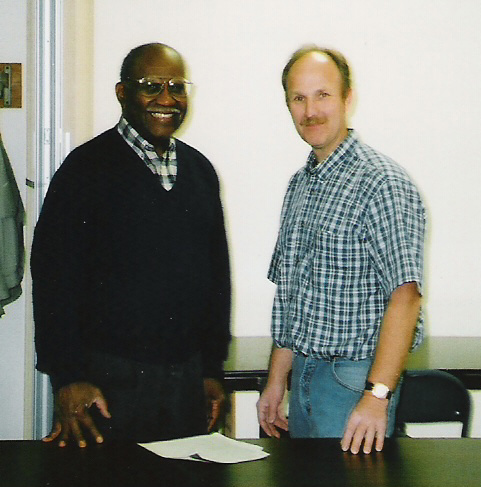 The interviews were arranged and assisted by Jonas Bender and Bennie McRae and were conducted in the Central Chapel African Methodist Episcopal Church. The students conducted 15 interviews in the five hours spent in Yellow Springs. "It's been a wonderful experience working with the veterans and interviewers from Washington Court House. It's been a stupendous experience. So much so, it will go down in history," said an enthusiastic Jonas Bender. Echoing these sentiments, Sara Randolph, a senior, stated, "I enjoyed listen to all the wonderful stories from the veterans." "It was very interesting," said junior Andy Sheridan, who is looking forward to working more on the project next year. These interviews were part of a project started last year by the 2004 Research History Class, and were continued earlier this year by senior Research History student Brian Bath. The Research History class have been assisted by the Veterans Service Office members Ron Sword and Ed Warning as well as the American Legion Post 653, American Legion Post 25, the Local Posts of Veterans of Foreign Wars, and Dr. Byron Stinson. All the interviews conducted will be made into transcripts and donated to the American Folklife Center at the Library of Congress in Washington D.C., where they will be kept to secure the stories of the veterans long after they are gone. When summing up the day, Bennie McRae stated, "I think this is a very unique event to come to this place, especially during this season, to listen to the veterans tell their story. I learned a lot and I think the interviewers learned a lot. I think it's great they are putting these transcripts together to give to the Library of Congress so they can be read by many generations. I'm happy to be a part of this." If you are interested in being interviewed as a part of the Research History project, please contact Paul LaRue at Washington Senior High School at 740-335-0820, or the Veterans Service Office at 740-335-1610.